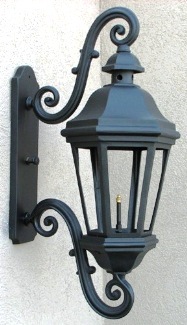 This is of wall mount gas type and has the same features as that of LeBeau Grande Electric type and it is available in midnight black and rust brown color. The flame pattern is that of a maple leaf or Fleur De Lis with six sided head as well as bottom scrolls. It is of same width and tall (i.e.) 14" wide x 39" tall with a projection of 20 1/2" from the wall. Price: THIS COMPONENT MUST BE ORDERED WITH A GASLIGHT. NOT AVAILABLE SOLD SEPARATELY.